The city affixed 1,804 red X signs to buildings deemed structurally unsound. Earlier this year, Curious City reported on a small symbol with a big impact on Chicago’s built environment. Now we’ve got an update. In June we brought you the story of Chicago&apos;s red "X" — sturdy, metal signs that the Chicago Fire Department affixed to 1,804 vacant properties between June 2012 and July 2013. Not every vacant building received a sign, just those that could pose a hazard to firefighters and other first responders in the event of an emergency there. 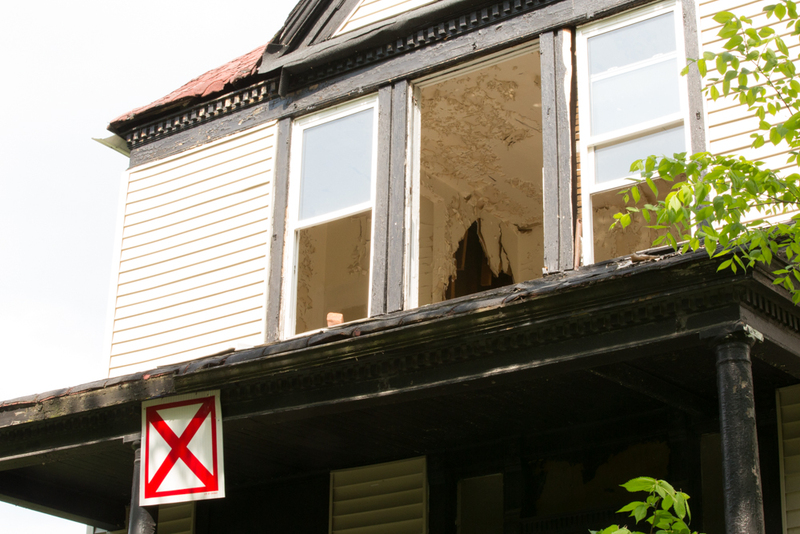 In reference to the red "X&apos;s" on abandoned/vacant, structurally unsound buildings, what can I do to see to it that additional funding is secured? Lopez is the mother of Edward Stringer, one of two firefighters who died on Dec. 22, 2010 when an abandoned laundromat collapsed on him and dozens more while they swept the burning building for people trapped inside. That incident spurred the creation of the red “X” program in the first place. Lopez, who retired to Lavaca, Arkansas, after working in personnel for the Chicago Fire Department, declined to comment for our original story. But she is troubled to learn that the program established to prevent tragedies like the one that befell her son appears to have fizzled out. So too is Michael Torres, Lopez’s other son and Edward Stringer’s stepbrother. Lopez is in touch with many other “survivors” who have lost friends and family in the line of duty. She says many of them want to see the red “X” program continue. Since our story ran in June, several city officials have said they wanted to see the program continue. Ald. Debra Silverstein, who sponsored the original red “X” ordinance, told us she wanted to find more money for the program. At least since WBEZ first reported that the program had run out of money, Chicago Fire Department spokesman Larry Langford says they’ve been hunting “anywhere [they] can” for more grant funding. But now the department talks about the program in the past tense. The fire department won’t put up any new red “X” signs for now, Langford says, but it will continue to register dangerous and structurally unsound buildings in an electronic database called the CAD, or Computer Aided Dispatch system, administered by the city’s Office of Emergency Management and Communications (OEMC). In addition to spearheading the ordinance that created the red “X” program, Ald. Silverstein also led the charge on requiring more regular data updates for OEMC’s CAD system and other databases. Langford says the electronic system works like this: When dispatch is alerted of a fire at a specific address, they pull up information on that location using the OEMC database. Firefighters print out that information before they leave the firehouse, but it will also appear on firefighters’ mobile terminals on site — in red letters. So from the firefighter’s perspective, Langford says, the electronic information communicates the same information as the red “X” was designed to provide. The electronic alert system is not dependent on grants, unlike the red “X” program, which was funded through a $675,000 award from the Federal Emergency Management Agency. Why not just apply for that money again? That initial funding was provided through the Assistance to Firefighters Grant program, which requires applicants to compete each year for a limited number of awards. Don Mobley, a local fire program specialist for FEMA, said that in 2011 the agency received more than 2,400 applications and gave out grants to just 201. We asked Mayor Rahm Emanuel’s office several times about City Hall’s opinion on the red “X” program, and whether any money could be found in state or local budgets to fund the initiative in the future. The office did not return our requests for comment. At any rate, Langford says, the electronic database is enough. If owners of red “X” buildings bring their property up to code, the Fire Department will still remove the metal signs, Langford says. But no new red “X” signs will go up unless they find new funding, which has proved elusive for 15 months. Meanwhile, in neighborhoods where red “X” signs are common, so is confusion over their meaning. We reported earlier this year on myths and misconceptions surrounding the symbol, as well as the impact of this scarlet letter on redevelopment efforts in areas of the city already troubled by disinvestment and foreclosure. “I can certainly understand how someone would think it means the building&apos;s being demolished or something else,” says Ald. Nick Sposato, a former firefighter. While Sposato says he supports the program, he’s not sure a red “X” would keep firefighters out of dangerous situations — sometimes, he says, that’s part of the job. And just like the red “X” signs, the information communicated by the OEMC system isn’t meant to rule out entry for first responders, just to advise caution in certain circumstances. For our question asker, Joyce Lopez, providing that information to firefighters is the important part, no matter how it reaches them. “To know they are aware before they get to a structure, that eases my heart at least. Unfortunately they don&apos;t really know what they&apos;re going to encounter when they get to a fire, but if they&apos;re given a little warning, I hope that could help prevent what happened to my son and Corey [Ankum] from happening to someone else,” she says.